Desert Breaker is an overhead run-and-gun, a sort of game which often falls into the genre of vertical shoot-em-ups. 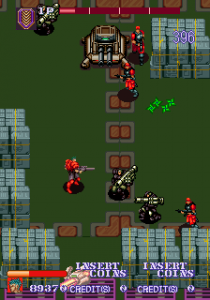 However, they differ from conventional shooters in that they allow you to go at your own pace and shoot in multiple directions instead of always moving and firing north. 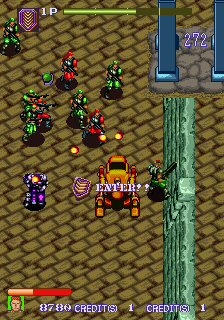 This formula was especially popularized by Capcom’s Commando, which is most definitely Desert Breaker’s primary inspiration. 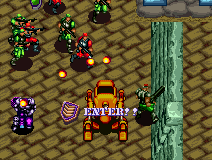 Specifically, it’s a clone of Mercs, the sequel to Commando and one of the best entries in this subgenre. 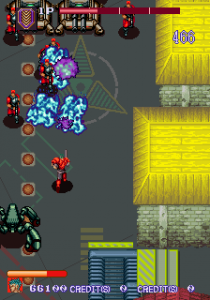 You could say that it’s not a clone if it plays like every other game in the series, but something about its graphical style is most definitely reminiscent of Mercs. The human commando sprites have familiar animation, the landscapes take place in similar mountainsides and deserts, and you even get to have up to three players at once. 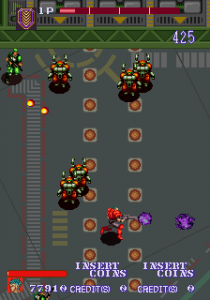 While Mercs was ported several times, Desert Breaker received absolutely bupkis from its initial release. 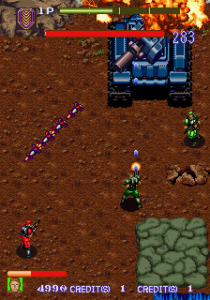 Maybe Sega didn’t want to advertise it too much as they realized how much it bit into Mercs‘ mechanics and style, but for as derivative as it is, it’s still an alright game on its own power. You get different objectives in each level which essentially equate to “reach the end of the level and blow up the boss.” You get four different weapons with which to do this: The machine gun, the flamethrower, the spread gun, and the comparatively rarer acid launcher. They can be powered up by finding P icons on the ground, and you also get a bomb meter which you can build by collecting medals. The more you collect, the more damaging your bomb blast is when you unleash. You also get a dash button that allows you to rush across the screen with a temporary window of invincibility, essentially acting as a dodge function. You’ll also occasionally find vehicles to help you, most of which are required like jet skis and snow machines; you also get an absolutely worthless and optional walker vehicle with an attack that barely hits enemies most of the time, but at least it takes damage for you! 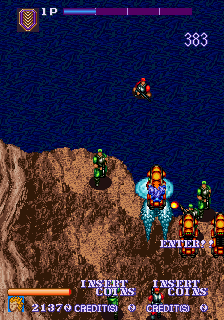 As per Mercs, you only have one lifebar that can be shredded rather quickly by all the tanks and big bosses you face, like the chopper at the end of the first level that you fight on a perpetually falling chunk of bridge. 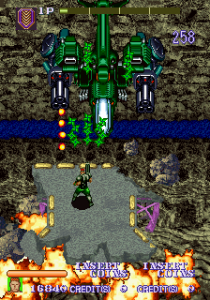 There are a few other awesome setpieces, like blowing everything up on a gigantic enemy aircraft and jumping all around its wings and cargo bays. 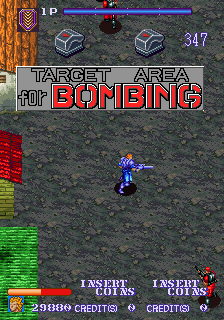 An interesting gimmick not found in other titles is that you get to pick a specific segment of the stage map to plan for an assist bombing. 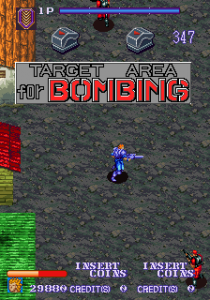 Whichever part you pick will be raided by friendly planes and nuke everything in sight while you completely survive a carpet bombing, much to the enemy’s detriment. Don’t analyze it and just take for granted you’re awesome enough to survive that. 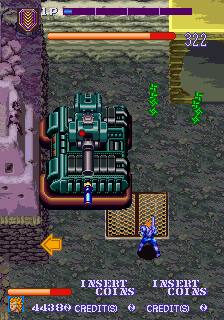 There are some areas where this feature is more desirable than others (particularly those where mid-boss tanks appear), but you won’t know which segments are most effective until you’ve played the game a few times. 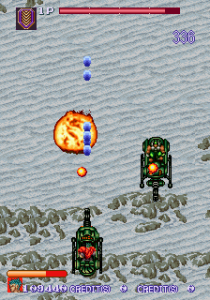 The bombing is a neat feature that helps curb the difficulty a bit, but it’s not as useful as it could be due to the game’s short length. Desert Breaker only has three levels, and even if the latter two take a fairly lengthy amount of time to get through, it still feels like it could do with another stage or two. It actually is on par in length with Mercs, but it may have felt like a more substantial game if its longer levels were broken up into several shorter stages each. The end product actually feels somewhat unfinished, as there isn’t really much of an ending after you beat the third and apparently final boss. To further compliment this theory, some animations and transition feel somewhat off-kilter, like most of the times when you fall in and out of the enemy airship just feel somewhat abrupt and stiff. Even if the ride feels like it ends too soon after it begins, Desert Breaker is still a suitably high-octane rush of a game full of explosions, testosterone, and the other blah blah blah that you hear for your textbook action game. It also seems to have a slight Operation Desert Storm influence, as early in the first stage, you break down a gate with either Arabic or Aramaic writing on it, and later in the same level, you see a poster of who’s clearly supposed to be Saddam Hussein. Whether it was intended to actually be set during the Gulf War in a move akin to SNK’s Guevara or if it was just done for laughs is up to debate. 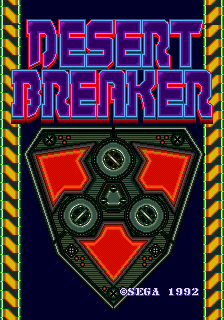 Anyway, while the end product doesn’t feel 100% complete (and given the lack of flyers, it’s unsure if it was ever actually released to the public), Desert Breaker is still quite fun and worth a play if you can deal with its transparent influences from Mercs.